A team of engineers at the University of Delaware has developed a technology that could make fuel cells cheaper and more durable, a breakthrough that could speed up the commercialization of fuel cell vehicles. They describe their results in a paper published in Nature Communications on Monday, Sept. 4. Hydrogen-powered fuel cells are a green alternative to internal combustion engines because they produce power through electrochemical reactions, leaving no pollution behind. Materials called catalysts spur these electrochemical reactions. Platinum is the most common catalyst in the type of fuel cells used in vehicles. However, platinum is expensive — as anyone who's shopped for jewelry knows. The metal costs around $30,000 per kilogram. Instead, the UD team made a catalyst of tungsten carbide, which goes for around $150 per kilogram. They produced tungsten carbide nanoparticles in a novel way, much smaller and more scalable than previous methods. 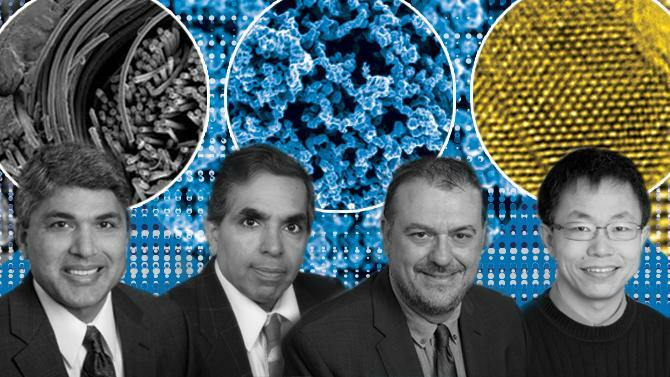 "The material is typically made at very high temperatures, about 1,500 Celsius, and at these temperatures, it grows big and has little surface area for chemistry to take place on," said Dionisios Vlachos, director of UD's Catalysis Center for Energy Innovation.. "Our approach is one of the first to make nanoscale material of high surface area that can be commercially relevant for catalysis." The researchers made tungsten carbide nanoparticles using a series of steps including hydrothermal treatment, separation, reduction, carburization and more. "We can isolate the individual tungsten carbide nanoparticles during the process and make a very uniform distribution of particle size," said Weiqing Zheng, a research associate at the Catalysis Center for Energy Innovation. Next, the researchers incorporated the tungsten carbide nanoparticles into the membrane of a fuel cell. Automotive fuel cells, known as proton exchange membrane fuel cells (PEMFCs), contain a polymeric membrane. This membrane separates the cathode from the anode, which splits hydrogen (H2) into ions (protons) and delivers them to the cathode, which puts out current. The plastic-like membrane wears down over time, especially if it undergoes too many wet/dry cycles, which can happen easily as water and heat are produced during the electrochemical reactions in fuel cells. When tungsten carbide is incorporated into the fuel cell membrane, it humidifies the membrane at a level that optimizes performance. "The tungsten carbide catalyst improves the water management of fuel cells and reduces the burden of the humidification system," said Liang Wang, an associate scientist in the Department of Mechanical Engineering. The team also found that tungsten carbide captures damaging free radicals before they can degrade the fuel cell membrane. As a result, membranes with tungsten carbide nanoparticles last longer than traditional ones. "The low-cost catalyst we have developed can be incorporated within the membrane to improve performance and power density," said . "As a result, the physical size of the fuel cell stack can be reduced for the same power, making it lighter and cheaper. Furthermore, our catalyst is able to deliver higher performance without sacrificing durability, which is a big improvement over similar efforts by other groups." The UD research team used innovative methods to test the durability of a fuel cell made with tungsten carbide. They used a scanning electron microscope and focused ion beam to obtain thin-slice images of the membrane, which they analyzed with software, rebuilding the three-dimensional structure of the membranes to determine fuel cell longevity. The group has applied for a patent and hopes to commercialize their technology. "This is a very good example of how different groups across departments can collaborate," Zheng said.